It still feels like a dream, but we are engaged! Mark proposed on September 20, 2013 with the most gorgeous ring ever and it was the best night of my life that I have ever had, by a landslide! It was a complete shock and absolutely perfect. A little backstory…..
Mark and I met in person for the first time at Disneyland, specifically in front of the “A” at the giant California sign at Disney California Adventure. Disneyland has continued to be our special place and we try to go as regularly as our schedules will allow. A few years ago, our beloved California sign was taken down due to a renovation at DCA. I had no idea where it ended up, but Mark had tracked it to Sacramento, where it had been donated to the state and placed at the California State Fair Expo. Mark’s bff tricked me into a roadtrip up north. He had told me that he was playing a show at a dive bar in Sacramento and to keep it a suprise for Mark! We weren’t going to be meeting up with our friends until the next morning so we had Friday night free. Mark told me that he had been looking up things to do in Sacramento and had a surprise that he wanted to show me and we pulled up to the letters! I was so excited to see them! At this point, I thought that this was all just a happy coincidence so when Mark suggested that we take a few pictures in front of it, I didn’t think anything of it! 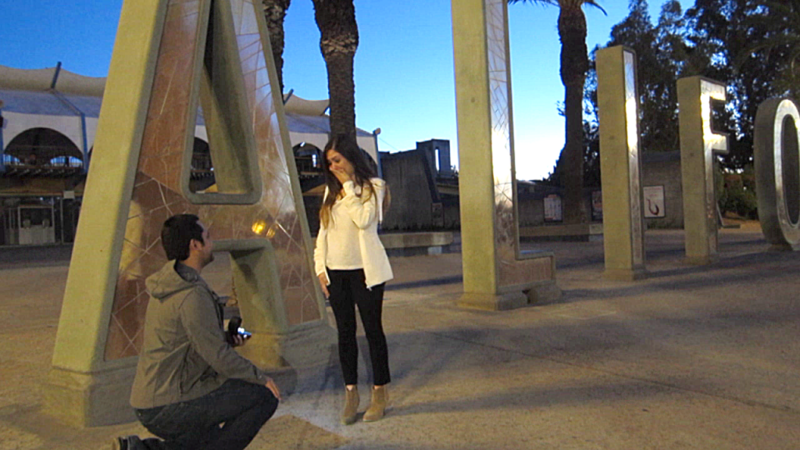 Video was rolling when he went down on one knee and the rest is history. I cannot wait to be this man’s wife. Gosh do I love him so. aw girl, this is such a sweet post. it almost made me cry. yes, i can be a sentimental sally! and i am so happy for you and your HUSBAND-TO-BE! WHEE!!! !